The mPower Emergency Illuminator™ is a personal illumination tool that offers Power On Command™. In addition to primary standard lithium batteries, the illuminator also features a groundbreaking reserve lithium battery with a shelf life of at least 20 years. Upon activation, via the simple twist of a knob, the reserve battery will provide power to light a high intensity LED lamp for approximately two hours of continuous use. The illuminator is also able to charge electronic devices – including cellular phones – through an accessory USB connection. Featuring design by Porsche Design Studio, the mPower Emergency Illuminator is equipped with two widely available CR123 3 volt lithium batteries. 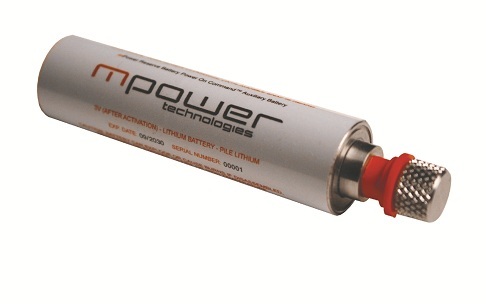 A second compartment houses the mPower On Command™ Reserve Battery, developed by mPhase Technologies, Inc., a leader in the field of nanotechnology as applied to reserve power sources. The mPhase 3 volt lithium reserve battery employs a custom-designed internal barrier and triggering mechanism to prevent liquid electrolyte from interacting with the solid electrodes until the battery is manually activated. Available in two finishes – Titanium Satin and Black Chrome – the illuminator incorporates a state-of-the-art high-intensity LED light source and a custom-designed optical lens assembly to provide optimum lighting for emergency applications. The design features a conveniently located USB plug adaptor (Type A) so that many brands of cell telephones can be recharged, allowing for the completion of an emergency call. A simple twist of the lens bezel will switch the illuminator between lamp and USB mode. A color-coded OFF/LED/USB indicator light will glow green in LED lamp mode, blue in USB mode. mPower has seemed to have design a rather impressive flashlight. With the available reserve battery, you will never ever again run out of battering right when you really need them. Also being able to connect to any USB device and charge it on the go is a rather pleasant feature. 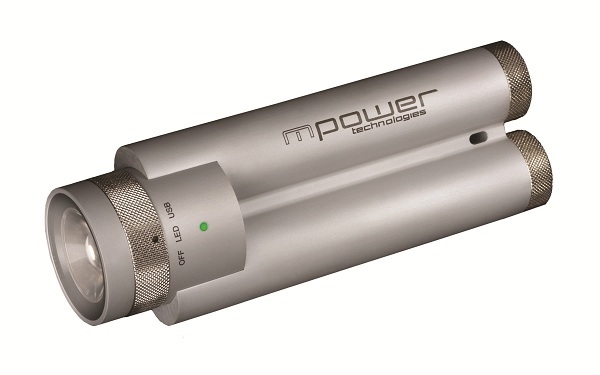 The mPower Emergency Illuminator will be exclusively available online at www.mpowertech.com starting March 2010 with a starting MSRP of $289.00. Very cute, though I have to wonder how many people will buy this. One, it’s available exclusively online. Two, a hundred and eighty lumens is quite respectable, but a bit dated. On the same batteries, a Cree XP-G of the latest generation could push close to three hundred, but obviously run time will suffer (badly?). I really do hope that the price comes down some, and that they get replacement reserve batteries on their store soon because a good flashlight can make many minor emergencies a lot more minor (try changing a tire in the dark sometime! ).